View More In Stockpots - Page 4. Our braziers are constructed of 18/8 stainless steel. Each brazier comes complete with cover and helper handles. NSF listed. What does NSF listed mean? NSF listed means that this item and the manufacturing facility it came from was tested and approved by the independent testing company called NSF - National Sanitation Foundation to be safe for commercial use. Restaurants need to adhere to higher standards for the cookware they use in commercial kitchen and all cookware needs to have the NSF mark on them. Although this is not a familiar consumer branded stock pot you see at department stores, what this means for you is the ability to own a commercial grade cookware item at a great price for use in your home. We sell a number of NSF listed cookware to our customers who own catering and restaurant businesses. This is top quality stuff that is made to withstand repeated use. You will not be disappointed by the quality and price by comparison to consumer name brand products that market themselves as professional or commercial. 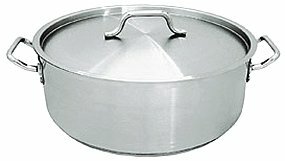 NSF listed cookware IS certified commercial grade. NSF listed. (www.nsf.org) The NSF Mark can be found on millions of consumer, commercial, and industrial products today. Products evaluated and certified by NSF International include bottled water, food equipment, home water treatment products, home appliances, plumbing and faucets, and even pool and spa components.